Change is coming for nonprofit human service providers, but will it make or break them? It is a time of reckoning for Connecticut’s private, nonprofit social services. After two decades of flat or reduced funding from its chief client — state government — community-based agencies are struggling to retain both their programs and the low-paid staff who deliver care for thousands of poor, disabled and mentally-ill adults and children. Depending on the vantage point, Connecticut’s nonprofit social services sector is viewed as either the best means to preserve the state’s safety net or as the cheapest route to drive down government spending. Those in the first category — relatives and advocates for the state’s most vulnerable citizens — are waiting to see whether Connecticut will fulfill the program of comprehensive, neighborhood-based care that was envisioned nearly four decades ago when the movement away from institutionalized care began. Robert Embardo is a 29-year-old guy in a Red Sox cap who has autism. He and his widowed mom rely on state-sponsored services and consider themselves among the lucky. Presently, more than a half dozen state agencies collectively spend more than $1.4 billion to hire private, nonprofit agencies to provide social services, health care, job training and other government functions. Though these resources are scattered among more than 1,200 contracts, involving hundreds of nonprofits, together these payments represent more than 7 percent of the General Fund. In terms of dollars, that’s larger than the departments of Transportation, Correction and Motor Vehicles combined. Nonprofits employ close to 190,000 people in Connecticut, about two-thirds of whom work in the human services field. The nonprofit social services sector in the United States has its roots in the early 1930s as The Great Depression was worsening. Established national and international programs, such as the Salvation Army and the Red Cross combined with religious affiliates, provided limited relief as their funding came chiefly from private donations, according to a 2001 analysis by Indiana University’s School of Public and Environmental Affairs. But the picture changed in the early 1960s as social reforms led to increased public spending on vocational rehabilitation for the developmentally disabled, institutional care, child nutrition and welfare and veterans services. Equally important, federal and state governments increased coordination to develop a safety net of services. “Advances in daycare, sheltering, counseling, employment training, and protection from child abuse and neglect have all proceeded through government contracting with nonprofit service agencies,” according to the Indiana University study. Between the early 1960s and the early 2000s, federal spending on private agencies grew from almost none of its social services budget to more than half. Meanwhile, many states turned to the private sector to take the lead in child welfare services and programs for the mentally ill and developmentally disabled. Connecticut followed this trend, particularly as pressure intensified to de-institutionalize services for these populations. The state was the target of a federal class action suit in 1978 filed on behalf of developmentally disabled clients at the Mansfield Training School. The complaint was based on the argument that care at this and other long-term facilities violated federal laws designed to protect the disabled. The case was settled in 1984 through a consent decree that applied to about 1,300 of the residents at Mansfield and the school finally closed in April 1993. Most of those residents were transferred to other state facilities or to private-sector care. A second lawsuit targeted Southbury Training School in 1984. And while the school has not closed yet, its population has dwindled from about 1,200 developmentally disabled clients to one-sixth that number. In 1995, Gov. John G. Rowland closed two of the state’s three psychiatric hospitals, Fairfield Hills in Newtown and Norwich State Hospital in Preston. In 1999, mental health advocates organized the Keep The Promise Coalition to press the state to fund community-based services for the people with mental illness who had moved out of institutions. 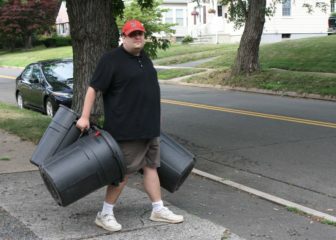 And as the state facilities in Connecticut closed or reduced their populations, community-based nonprofits multiplied. By 2002, state agencies had entered into nearly 2,500 contracts with nonprofits to provide everything from medical and rehabilitative services, nutrition and counseling, meals on wheels, housing assistance, substance abuse treatment, employment and vocational training, psychiatric care, and a host of programs for clients with developmental and intellectual disabilities. Connecticut spent just over $1.3 billion on those services in 2002, or $1 out of every $10 spent from the entire General Fund. But while lawsuits and other efforts by advocates led to privatization, budgetary and political forces at the state Capitol resisted. The constitutional spending cap ratified in 1992 to temper voter outrage about the new state income tax would eventually be declared unenforceable in 2015. But throughout the 1990s and most of the first decade of the 2000s — when the state’s coffers enjoyed many robust years — the cap still took a toll on budgetary growth. While the state was flush with money from income tax receipts between the mid-90s and early 2000s, things were much leaner at nonprofits. Annual rate hikes for nonprofits typically ranged from just 1.5 to 2.5 percent during this period — less in lean years. The meager increases were inevitably followed by studies produced by nonprofit associations arguing they couldn’t afford to pay social workers and other staff enough to avoid massive turnover rates, ranging from 20 to 30 percent per year. Rowland, who served from 1995 through mid-2004, tried to privatize many state-owned group homes for the developmentally disabled, but the Republican governor ran into strong opposition from the state’s largest healthcare workers’ union, New England Healthcare Employees Union District 1199 (now known as SEIU Healthcare 1199NE) and the Democrat-controlled General Assembly. Once Connecticut plunged into what many economists called “The Great Recession” in late 2008 — and then struggled through a recovery that trailed the rest of the nation — the problem for nonprofit agencies ceased to be Connecticut’s spending cap. Instead, it was simply state spending — or a lack thereof. For the past decade, the problem for many interest groups has been the state’s perpetual budget deficit. Despite major tax increases in 2011 and again in 2015, tax receipts grew just 20 percent between 2008 and 2017. Meanwhile, debt and retirement benefit costs that consumed just 12 percent of the budget in the late 1990s now eat up about one-third of the state’s General Fund. And these retirement benefit costs are just beginning to surge, following a trajectory projected to spike in the early 2030s. In other words, their squeeze on the state budget will likely get much worse before it gets better. These and other largely fixed costs in the budget — state employee payroll and health care, and Medicaid — already lock down more than half of all resources. That largely leaves municipal aid, higher education and social service programs — all three of which have had to tighten their belts repeatedly over the past decade. 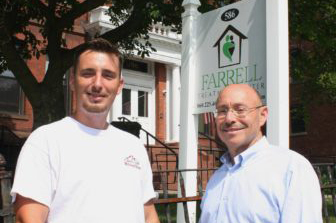 Dennis Pupowski had hit rock bottom when the staff at the Farrell Treatment Center got him and turned him around. The clinic’s resources, however, are dwindling. Connecticut Voices for Children, a research-based public policy group in New Haven, annually tracks expenditures in “the children’s budget” — programs in education, health care and social services aimed at minors. In 1992, the first fiscal year Connecticut implemented the new state income tax, the children’s budget comprised nearly 40 percent of the General Fund. Twenty-six years later, despite income tax hikes in 2003, 2009, 2011 and 2015, the children’s budget has dropped steadily to a 27.3 percent share. Through 2017, the state was spending about $1.42 billion on all contracts with nonprofit agencies. At first glance that’s $113 million more than it spent in the early 2000s. But that’s less than a 9 percent increase spread over 15 years. Spending on nonprofits represented 10 percent of the overall budget in 2002, compared to just 7 percent now. Adjusted for inflation, present-day spending reflects a 22 percent cut from 2002 levels. Legislators gave nonprofits that serve Department of Developmental Services’ clients a 5 percent rate increase this fiscal year — but it came with several restrictions. Most nonprofits were mandated to pump all of those extra dollars into wages. In other words, any cost increases tied to maintenance, technology, debt service, or energy costs had to be borne by the agencies. Nonprofits contracting with other agencies got a 1 percent rate increase — but also were mandated to invest all of that money to raise worker pay. Through 2017, the median nonprofit agency contracting with state government had substandard reserves and an excessive ratio of debt to its total assets — according to the state Office of Policy and Management. Who gets the savings from shifting providers? But nonprofits say the problems go deeper than the numbers. In its briefing for state legislators written earlier this year, the CT Nonprofit Alliance — which represents more than 300 community-based agencies — wrote that 100 percent of those it surveyed reported an increased demand for services over the past five years. More importantly, stagnant state payments to nonprofits have not meant Connecticut isn’t asking these agencies to assume greater burdens. In some cases, nonprofits provide almost all of the state-sponsored services. More than 90 percent of residential services to people with intellectual and developmental disabilities are already served by community providers, according to the alliance. But that doesn’t mean the nonprofit community wants the state to reduce the caseloads it assigns. In fact, nonprofits have been pushing more aggressively for Connecticut to move more people from state-run facilities into nonprofit care. But that has led to another question. If the state can save money by privatizing more social services, who should benefit from the savings? Should it be the nonprofits, who claim they have been under-funded for decades? Or should the state redirect those savings elsewhere — specifically into cash-starvedretirement benefit programs for state employees and municipal school teachers? Those costs are expected to grow dramatically by several billion dollars over the next 15 years. But others argue that the state can’t afford not to use privatization to offset rising costs in other parts of the budget. Connecticut Business and Industry Association Vice President and Economist Peter Gioia. Gioia and other business leaders have pointed repeatedly to a series of studies released in 2011 and 2012 by the Connecticut Institute for the 21st Century, a business coalition focused on achieving greater cost efficiency in state government. The splintered approach makes it more difficult for individuals and families to obtain the services they need or measure results effectively, the report added. Gioia and others also have argued there may be too many community-based nonprofits competing for scarce state dollars. 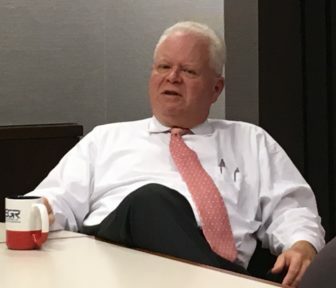 State government might be able to cut costs, shift significant amounts of savings to cover rising pension costs, and still have some left to bolster nonprofit providers — if the overall number of agencies were reduced, he said. But considerable consolidation already has occurred. The state had awarded nearly 1,900 contracts to nonprofits one decade ago. That number is closer to 1,200 now. Still, the pressure to cut social service costs in the state budget — even at the expense of the private, nonprofit sector — has taken other forms. In 2017, state legislators considered but opted not to impose property and sales taxes on nonprofits. The principal argument for this is that Connecticut’s ability to compensate cities and towns that are home to tax-exempt nonprofits is slipping. Connecticut has long had some form of a PILOT (Payment In Lieu Of Taxes) grant. But since the last recession ended in 2009, legislatures and governors have carved out exceptions and paid less as they grappled with skyrocketing pension and other debt costs. In statute, PILOT grants are supposed to replace about 45 percent of the funds communities lose because they can’t tax state property. In 2010, communities got $74 million or just 28 percent of the $264 million they lost on state property. That ratio steadily has been reduced, and this past fiscal year cities and towns received just $50.3 million — or 14 percent — of the $356.2 million they couldn’t collect. Similarly, separate grants designed to replace 77 percent of taxes lost on nonprofit colleges and hospitals also have been whittled down. Municipalities received $115 million or 43 percent of the $271 million they couldn’t collect from colleges and hospitals in 2010. By this fiscal year, communities got $98 million — or 23 percent — of $432 million in lost tax revenue. Rep. Melissa Ziobron, R-East Haddam. “Community providers would have less funding to provide services, resulting in fewer people receiving mental health services, less food for hungry families, fewer beds at homeless shelters, and fewer therapeutic arts programs for people with disabilities,” the CT Nonprofit Alliance wrote in a briefing to lawmakers in early 2018, urging them not to revive the tax proposals. 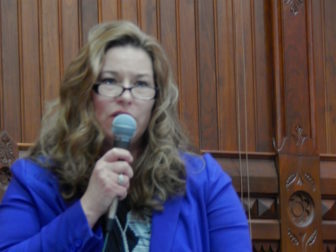 Rep. Melissa Ziobron of East Haddam, ranking GOP representative on the legislature’s Appropriations Committee, said she is still working to determine how much nonprofits need versus how much they want. Still, the pressure has grown on the private, nonprofit community to the point where a traditional ally — unionized, state-employed social workers — have to a certain extent become rivals. In the past, advocates for both groups would team up to lobby lawmakers for more funding for all. Cracks began to appear in this approach four years ago when advocates for the developmentally disabled in privately run group homes urged legislators to find more money for these programs — by taking it from state-run institutions. 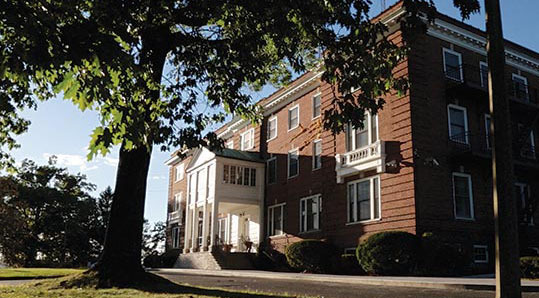 In December 2014, armed with a court expert’s new recommendation to close Southbury Training School, several advocacy groups argued Connecticut unfairly spends too much of its limited resources on a small class of institutionalized disabled while ignoring thousands awaiting community-based care. Leslie Simoes, formerly of The Arc. Simoes added that “We have an outdated system of ‘haves’ and ‘have-nots’ that doesn’t reflect the needs of families and individuals” with intellectual and developmental disabilities. That argument now has become a regular component in the private, nonprofit agencies’ annual message at the Capitol. But some state officials say things aren’t that simple. Office of Policy and Management Secretary Ben Barnes. Unlike the private sector, state government does not have the option of declining to treat a developmentally disabled patient, or an abused child, simply because the case is extreme and the treatment costly. “At the state, we take all comers and sometimes it costs more,” said Office of Policy and Management Secretary Ben Barnes, Gov. Dannel P. Malloy’s budget director. State-employed social workers generally enjoy better wages and benefits than their private-sector counterparts, but is it necessarily better to move more people out of better-paying state jobs? The president of Connecticut’s largest healthcare workers’ union, David Pickus of SEIU Healthcare 1199NE, said the “demonization of the public worker” is leading some to consider choices that cause a lot of collateral damage among the state’s most vulnerable populations. Pickus’ union represents 25,000 workers in Connecticut, including 7,000 in state government. To contain costs, the private sector pays lower wages and offers less generous benefits, Pickus said. To avoid overtime, more part-time employees are hired. The high turnover rates in the private sector don’t pose problems just for the agencies, he said, but also for the clients, who form close bonds with one social worker only to see that person leave in a few months. 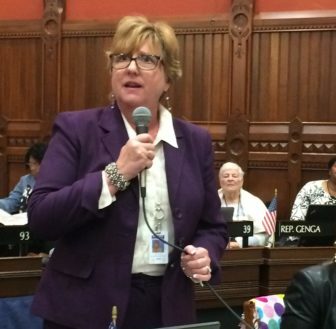 Rep. Cathy Abercrombie, D-Meriden, one of the legislature’s most ardent social services advocates, said the state’s controversial waiting list of developmentally disabled citizens needing residential placements tells the larger story of the private, nonprofit sector. That waiting list, involving nearly 2,000 people, is 33 percent longer than it was about 15 years ago.